1.0 What is an Architect? Architecture is one of the oldest profession in the world. An architect is a designer of buildings. They don’t actually construct them, because they have builders working for them. Architects are the leader in the construction industry, usually second only to the client or developer. They don’t just design buildings, architects also take into consideration the clients needs and requirements and protects their rights. The architecture profession in Malaysia is protected by law. The regulating and governing body of the architecture profession in Malaysia is known as Lembaga Akitek Negara (LAM). They govern the entire profession starting from the definition of an architect under the Malaysian Constitution, licensing, practice, acts and enactments as well as education. The other body that concerns the well being of architects themselves is Pertubuhan Akitek Malaysia. It functions as an association that takes care of its members, organize functions and manages the professional development of an architect from the lowest to highest qualification. Just like Bar exams for lawyers, architects also require certain level of qualification that is a standard worldwide. The qualifications are known as PAM Part 1, 2 and 3. The equivalent of this is RIBA (Royal Institute of British Architects), AIA (American Institute of Architects) and RAIA (Royal Australian Institute of Architects). 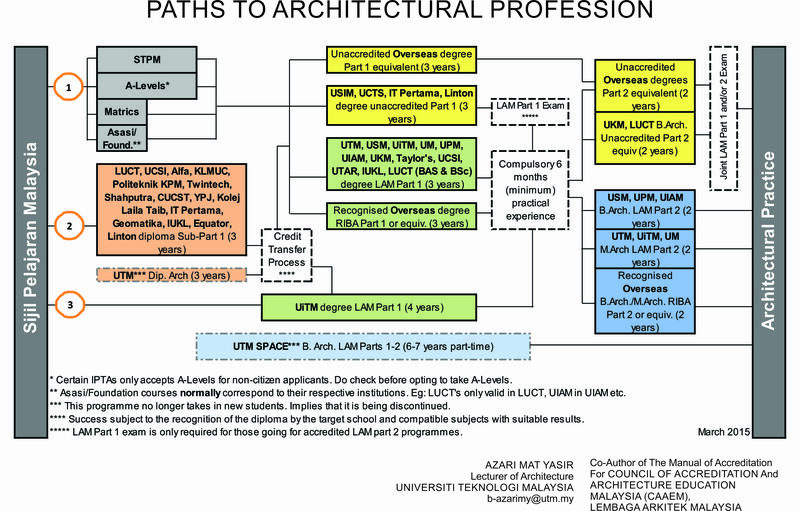 BLUE – degrees that lead to LAM accredited Part 2 architecture. GREEN – degrees that lead to LAM accredited Part 1 architecture. YELLOW – degrees that in currently unaccredited by LAM, but is of Part 1 or 2 equivalent. ORANGE – diplomas that are sub-Part 1. RED – LAM qualifications exams to be taken independently. 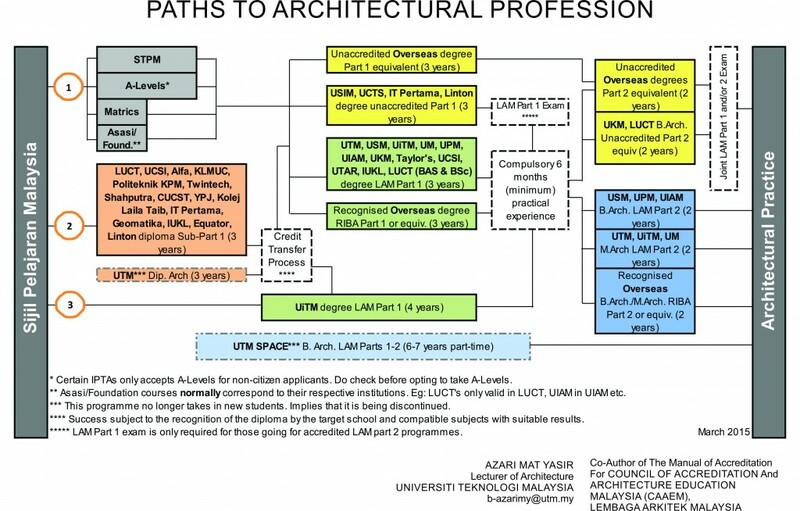 The diagram above illustrates, as simple as possible, the route to become an architect after SPM. There are several ways to do so, and it is totally up to a person. The choices are quite open, where students can generally study fulltime in Malaysia, partly in Malaysia+overseas, or fully overseas. Each of the choices above have its own advantage and disadvantages. This I will elaborate further in the future. Most important factors are time and money. So the next question would be: where can you study architecture? LAM in collaboration with Malaysia Qualification Agency (MQA) (formerly known as Lembaga Akreditasi Negara LAN) frequently assesses schools (once every 5 years) in order to maintain the standard of education for architecture. New schools will need to be assessed fully before given accreditation. As I’ve mentioned before, to obtain Part 1 and 2 qualifications, the diploma or degree must be accredited by LAM and MQA. Important note: In architecture education, there are two bodies awarding recognition/accreditation: LAN/MQA and LAM. LAN/MQA is responsible in ensuring that the course offered complies to the standard of awarding an academic certificate (diploma, degree etc). Not having a LAN/MQA recognition simply means the school does not have high enough standard to award a single degree, let alone an architectural degree. LAM on the other hand monitors the quality of architecture education, ensuring that a degree produces qualified architect for practice. Not having LAM accreditation means the degree still has value, but not enough to become a legally licensed architects. However graduates still have the option to take LAM exams independently. Studying overseas is one of the recommended option to study architecture. It is advised that an architect to travel as much as they can, to understand other buildings, arts and cultures. I personally would recommend studying in Europe, as you can really benefit a lot from travel. Listed below are accredited schools by LAN & LAM, which upon graduation, you will be automatically awarded PAM part 2, an additional qualification apart from the given RIBA equivalent. The diagram above illustrates common paths that most architecture students with Part 1 took after finishing up their first degrees. Yellow choices indicate academic paths, and blue choices indicate work/practice paths. It is also common that students choose to work for a year or two before continuing for their Part 2. Having work experience tremendously boosts their chances to land a place in a university, not to mention the advantage of experience they have over other students who went straight from Part 1. Due to so many questions about what subject(s) to take during SPM that would be considered relevant to architecture, I’ve tabled out all the SPM subjects (not including vocational subject category) and explained more or less on its relevancy to architecture education. i. Subject – Subjects that have been categorized according to its similar contribution towards architecture education. ii. Category – Keywords of relevant knowledge or skills that is attributed to the subject in architecture education. iii. Description – A brief description on what the subject could contribute when studying architecture. iv. Relevance – The value of taking that particular subject in relation to learning architecture. This table is not to be confused with the intake requirement for any university. This list compiles the relevance of the subjects according to the typical architecture curriculum. Meaning, not taking a “Very Relevant” subject does not put you at a disadvantage when applying for architecture compared to those taking it. The other reason for this table is to demystify the common misconception that students need Math, AddMath, Physics and Arts in architecture, where in actual fact, those requirements are only needed when applying for the course. The purpose of this table is to provide general knowledge so anyone who just finished PMR could decide which subject they want to take for SPM in order to benefit the most during architecture education. I wrote this guide as universal as possible so that anyone who’s interested in pursuing this field can get a definitive idea of what to do, where to go and how. I will update this as frequent as possible, particularly on the path of studying architecture diagram. Although I’m attached to UTM, my intention is purely altruistic and to provide information as neutral as possible regarding architecture education in Malaysia.